Senate aides confirmed Friday that Republicans are coalescing around an alternative to the sequester that would keep the lower spending levels in place, but give federal agencies greater flexibility to determine where the cuts are implemented.The exact details of the Republican proposals are unclear. A GOP Senate aide told Business Insider that Republicans are considering a plan that would fund the government at the levels dictated by the sequestration — which amounts to about $85 billion in spending cuts for fiscal year 2013 — while giving the Obama administration the flexibility to reprogram the cuts at their discretion, provided that the balance remains between defence and non-defence discretionary spending cuts. As TPM’s Brian Beutler points out, the plan — which has gained traction among prominent conservative commentators, including the National Review editorial board and Karl Rove — is politically savvy for several reasons. 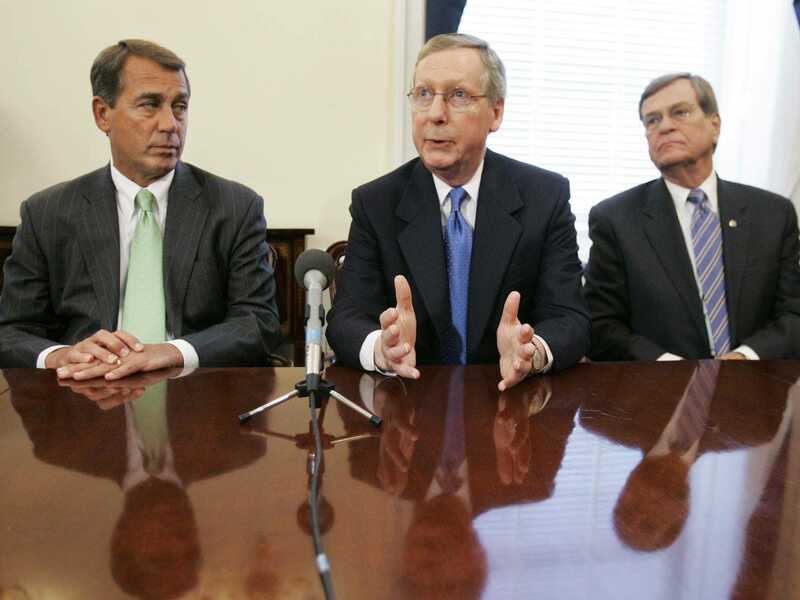 First, it deals with the biggest problem of the sequester, namely its meat-cleaver approach to spending cuts. This undercuts the White House’s main argument against the sequester, which is that the cuts are arbitrary, and therefore threatening. The Department of Transportation, for example, only needs to find $1 billion in cuts this year, or about 2 per cent of its $55 billion budget. If the cuts are not applied uniformly to every program, it’s hard to imagine that the DOT could not cut $1 billion from the department with marginal impact to its workforce and to everyday Americans. The one problem with the GOP plan, however, is that it is unlikely to mitigate the effect of the spending cuts for the defence Department, a key concern among Republicans. “We prefer to have some more latitude, but at this stage in the game, the cuts are going to be painful no matter what,” Lt. Col. Elizabeth Robbins, a spokesperson for the Pentagon, told Business Insider. The White House is likely to use this as political cover against the Senate Republicans’ flexibility proposal. One Senate Democratic aide told Business Insider that Democrats are ready to reject the Republican plan, and will continue to insist that any sequester replacement include both spending cuts and new tax revenues. Moreover, House Republicans are also unlikely to provide much support for a plan that gives the Obama administration the authority to determine the spending cuts.